Has recorded .295 career batting average. Barreto was signed by Toronto for $1.45 million back in 2012 and then traded to Oakland — along with Kendall Graveman, Brett Lawrie, and Sean Nolin — in exchange for Josh Donaldson. Bay Area sports talk radio still discusses the deal with frequency and bile, and largely considers Barreto the last hope for salvaging it, though Graveman and his sinker appear to be breaking out this year. Indeed, Barreto is a gifted offensive player and reached Triple-A last year as a 20-year-old after slashing .281/.340/.413 at Double-A. He has exceptional bat speed, is adept at recognizing breaking balls, and is able to put a full-bodied charge into the baseball despite a short (but strong) frame. 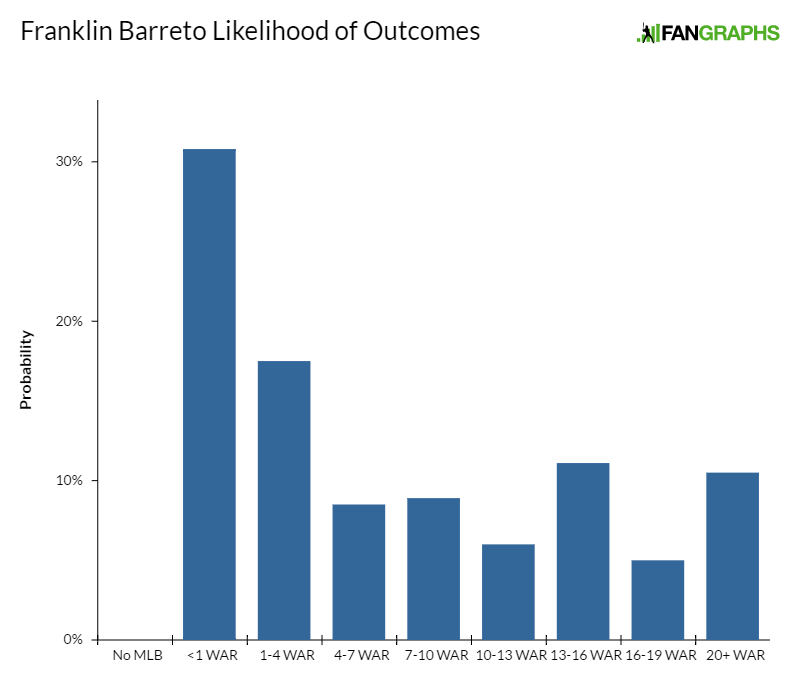 While there is some effort-based swing and miss about Barreto’s approach, he has a chance to hit for both average and power, the latter likely to come more in the way of dozens of doubles than via the home run. And while Barreto has largely been groomed at shortstop as a minor leaguer and has the physical tools to play there (he’s a comfortably plus runner with plus, max-effort arm strength), he lacks the actions and athleticism to play a big-league-quality short right now. He’s only 21, so some feel he has time to polish up his glove at short, but others regard Barreto’s lack of footwork and grace as innate, not something that can be taught or learned, and have him projected elsewhere. Barreto’s hands, actions, footwork, and inability to make strong, accurate throws from awkward platforms all left doubts in the minds of scouts who saw him play shortstop and second base in the Fall League. Many, including myself, would like to see more of him in center field. He has the speed to be effective there. Regardless of where Barreto ends up on fitting defensively, it’s likely to be at a premium, up-the-middle position, and his bat will profile there comfortably. It simply might take a bit longer for that aspect of his profile to be fully developed than is typical for a prodigy at Triple-A. At age 21, that’s less of a concern than it ordinarily would be. It’s also worth mentioning that Oakland has been willing to buck defensive stereotypes at shortstop in recent years, and might consider Barreto a middle-infield fit even if scouts outside the org do not. Has produced 27 strikeouts, four walks in four appearances thus far in 2017. Even after an inconsistent spring, Puk’s rare combination of size, stuff, and big-conference performance merited a high draft pick. Oakland obliged, selecting him sixth overall. Amateur scouts were concerned about Puk’s conditioning, lack of athleticism, and the way those two things impacted his mechanical consistency, command, and propensity for injury. Puk dealt with a back injury last spring, which concerned scouts who thought it was heavily involved in his delivery or who considered it a harbinger of doom for an athlete in his early 20s. Last fall, Puk was 91-95 (mostly 92-93) with a plus, mid-80s slider that sometimes came tilting in with more than 2700 rpm. While he’d often exhibit some form of arm deceleration while throwing his changeup, every now and then he’d flash an above-average change capable of missing bats. This spring he showed up not only in what appears to be much better physical shape but with a rebooted curveball that he hadn’t thrown since high school and which scouts already consider to be average. While we’re still waiting to see what kind of strike-throwing strides Puk is going to make with his improved ability to repeat his delivery, early indications from this spring are encouraging. Scouts who previously thought there was some non-injury risk that Puk would end up in the bullpen think he’s now likely to develop average command. With a four-pitch mix, two of which project to plus, he has significant upside, arguably approaching that of a top-of-the-rotation arm. Cutter usage up 5% from 2016, changeup usage down 7%. Acquired from the Dodgers along with Grant Holmes and Frankie Montas in the deal that sent Rich Hill and Josh Reddick to Los Angeles, Cotton and his Bugs Bunny changeup have ascended to the majors and are having early-career success. Though clearly undersized (something about which I think Oakland correctly cares less than other franchises), Cotton is a terrific athlete with a full palette of pitches with which to paint, headlined by that upper-70s changeup which often has a 15 mph delta off his fastball. 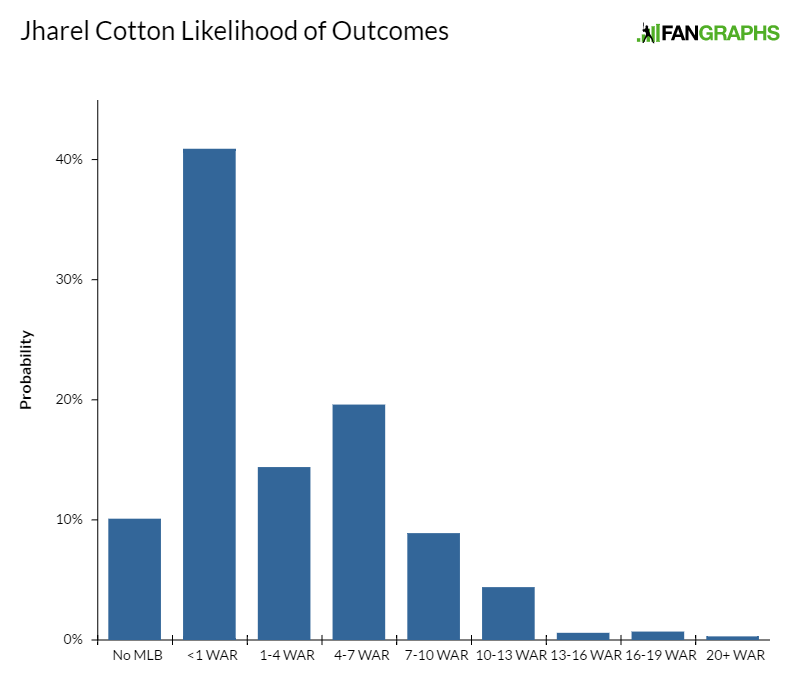 Cotton also works in an above-average cutter quite frequently and will loop in an average curveball. Some scouts think Cotton’s delivery, during which he swivels about an axis created by a stiff front leg, limits his command. Those scouts think Cotton profiles as more of a No. 4/5 type of starter. Others, including myself, believe enough in the athleticism and depth of the repertoire to consider him an above-average big-league starter. Has recorded 26% career strikeout rate, including 30% strikeout rate at Double-A and above. 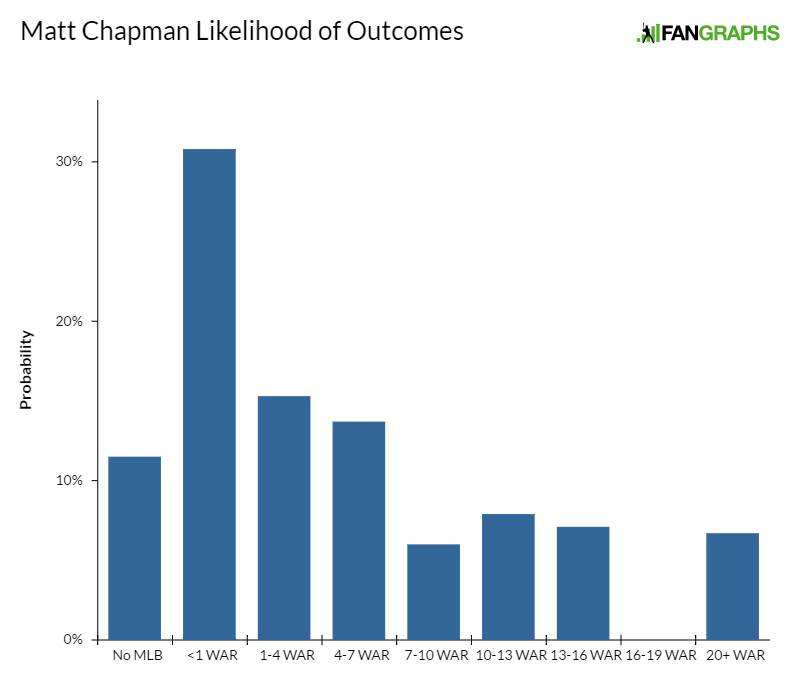 Chapman has tracked exactly as anticipated when he was selected in the first round of the 2014 draft out of Fullerton. He’s an excellent defensive third baseman, flexible in both the knees and at the waist, and adept at positioning his body as he approaches grounders, in a way that allows him to make strong, accurate throws. He also has a terrific first step and lateral range, with solid hands. He’s a future plus defensive third baseman with a plus arm, and there are scouts who have 70s on either or both. At the plate, Chapman produces big raw power with relatively little noise or movement in his hands, pre-swing. He lacks bat control and swings over the top of lots of breaking balls, which has resulted in career-long issues with swing and miss. He has a 30% strikeout rate at Double-A and above and struck out in six of his seven at-bats this year before injuring his wrist. An MRI revealed no structural damage. Chapman needed wrist surgery in 2015, causing him to miss the Fall League. He also missed several weeks earlier that year due to a knee injury. The upside here is that of an impact defensive third baseman who hits 25-plus annual homers. Jake Lamb was worth 2.5 WAR last year with a similar offensive profile and worse defense than Chapman projects to provide, but there’s swing and miss (even more than Lamb, who led regular third basemen with a 25% strikeout rate last season) and injury risk here. Steamer and ZiPS project FIP between 3.60 and 3.90 for this season. The well-traveled 24 year old Montas’s long-term destination is in the bullpen, largely because Montas has had trouble staying healthy, sustaining multiple rib/oblique injuries. Out of the bullpen (even in multi-inning outings), Montas can sit 97-101 (he’s averaging 97 mph so far this year) with a plus, upper-80s slider that will crest 90 mph. He’ll flash an average changeup and his potentially viable three-pitch mix is why each of his employers has tried to develop him as a starter. He’s now pitching out of Oakland’s bullpen and projects to be a potentially elite late-inning arm. None. Was hurt at Cal and barely threw in pro ball. If not for a shoulder injury last spring (which was initially reported as a calf injury), Jefferies might have been the second college pitcher off the board last June after Puk. He’s a good-bodied, highly athletic pitcher with low-to-mid-90s heat, a plus changeup, and a fringey breaking ball. Last summer, Jefferies was throwing a curt, mid-80s slider with mostly horizontal movement. This spring he’s been working with a slower, two-plane curveball that is fringey on pure movement but effective when Jefferies is locating — something which, because he’s so athletic, he often does. Jefferies changeup is hard, often 86-88, but has late dip and sneaks under barrels despite little velocity separation from his fastball. It’s already above average and a potential plus-plus offering for some scouts. The concerns surrounding Jefferies’ shoulder injury from last year are reinforced by his short-striding, cross-bodied delivery. He gets little mechanical aid from his lower half and relies mostly on pure arm acceleration to generate velocity. Few starters pitch 200 or more innings with this kind of delivery. On stuff, Jefferies has a chance to be an above-average changeup/command starter, but the injury and delivery concerns add more risk to his profile than is typical for a college arm. Recorded 6% walk rate in 2016, is at 12% early in 2017. The short-striding, quick-armed Gossett pitches from a unique, modified windup that simplifies his historically busy on-mound footwork. Gossett’s fastball misses bats up in the strike zone and will touch 96. He mixes in a hard, late-breaking slider and consistently locates it down, away from where right-handed hitters can catch it. He also has a fringey curveball that has good shape but lacks bite and which is mostly used as an early-count surprise to get Gossett ahead in the count. His changeup’s effectiveness is predicated on Gossett’s arm speed, which mimics that of his fastball. 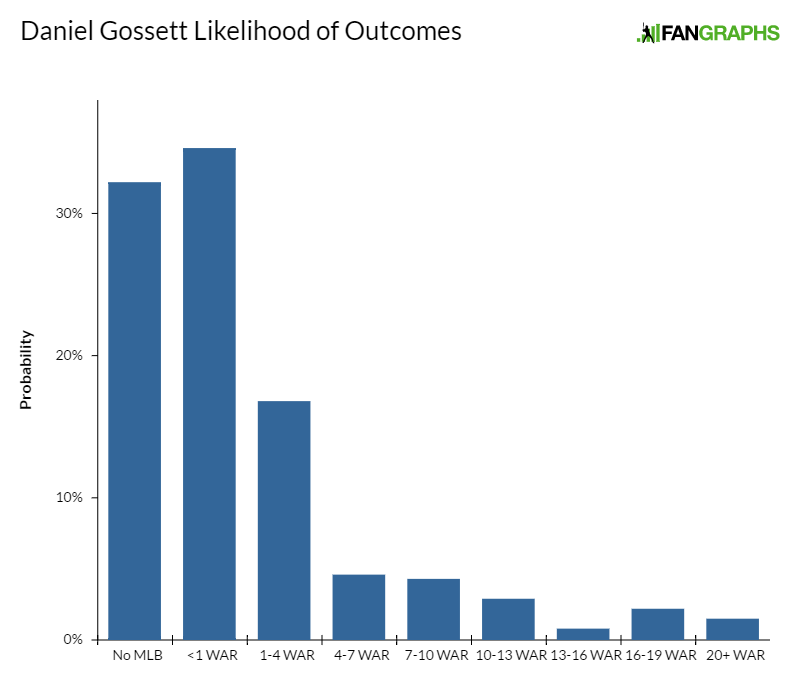 Without a true plus pitch, Gossett doesn’t project to miss a high ratio of bats in the majors, but his four-pitch mix and ability to fill the strike zone project to the back of a rotation. Given his durability in recent years, he carries relatively little risk. Walk rate by year: 13% (2014), 13% (2015), 7% (2016). Fillmyer spent his freshman year at Mercer County at shortstop and pitched only 7.2 innings, but the Rockies drafted him as a pitcher anyway. He returned to school and took, primarily, to the mound, buoying his stock to the fifth round. He has only been pitching full time for a few years now and was experimenting with a new curveball grip last year. While it’s still inconsistent, it flashes plus with powerful downward action and is hard, in the mid-80s. Fillmyer can throw it for strikes and bury it beneath the zone, though at times his arm action lacks conviction and he tips the pitch. That should be ironed out with continued usage. 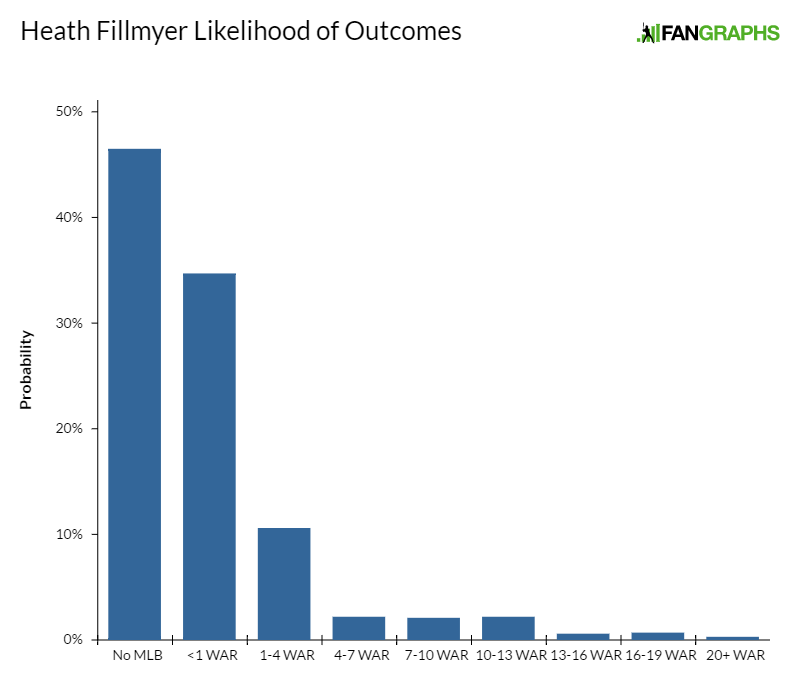 Fillmyer has a chance to be a league-average starter with an above-average fastball, curveball, average changeup, and at least average command. Oakland has been building upon his workload steadily for the last two seasons and, already at Double-A, he should be ready for a full slate of starter’s innings next year, when he’ll likely make his debut. Strikeout rate by level: 32% (Arizona League), 28% (Pioneer), 26% (Midwest), 22% (Cal League with LA), 17% (Cal League with Oakland). Holmes destroyed the AZL after he was drafted, filling the strike zone with a mid-90s fastball which most hitters at that level couldn’t touch. He has had trouble throwing strikes since then, walking 109 hitters in about 250 pro innings. This spring, Holmes showed up looking svelte (he was already a thick 6-foot-2 in high school), but his stuff was down during the spring, sitting 91-93. He also threw a fringe change and short power curveball in the 82-84 range that was consistently average and flashing above, its effectiveness hinging largely on how late it moves more than its quantity of movement. Holmes has a long, slingy arm action and scouts aren’t sold on his changeup projection. 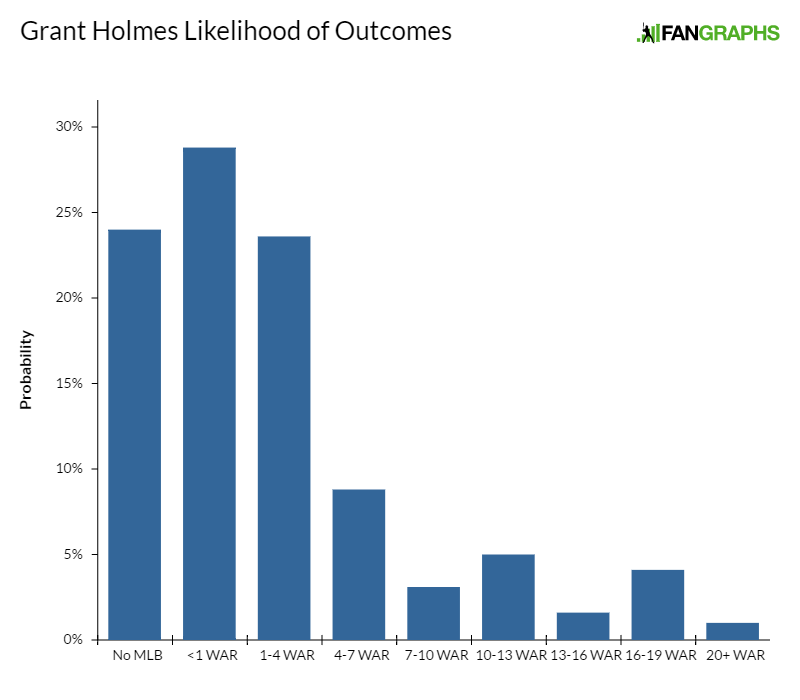 If neither the change nor the control ever develops, Holmes fits better in a bullpen. If he starts throwing more quality strikes, he fits in the back of a rotation. Has posted career 4.5% walk rate. 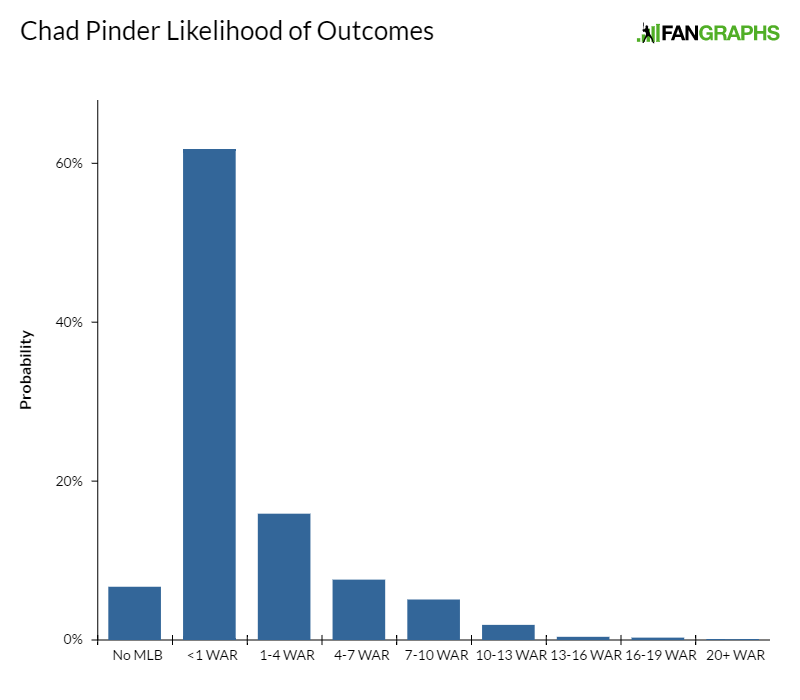 Pinder’s value is tied to his bat, which produces strong line-drive contact to all fields. He has good feel for the barrel and above-average bat speed, producing fringey 12-15 home-run power. Pinder is aggressive at the plate and exhibits some head violence during his swing, which leads to some swing and miss. But the quality of the contact when he makes it is excellent, and he projects as an above-average hitter. Oakland, which is more inclusive regarding shortstops than the average MLB club, has left Pinder at short throughout most of his minor-league career (he’s gotten reps at second and at third but hasn’t played the latter in games for over a year) despite below-average speed. His arm fits anywhere on the infield and, even if a given scout isn’t excited about having him at short, Pinder is passable there. The bat is a bit shy of profiling every day at second base, while the glove is fringey on the other side of the bag. This is a classic bat-first utility profile. Recorded 1.05 career WHIP at Florida. Though he lacks big velocity and the upside typically associated with it, Shore carved up SEC hitters as a junior with advanced command and a plus changeup. At Florida, he was the most consistent performer on the most talented pitching staff in the country. Shore has a below-average breaking ball and sits 88-92 with his heater, so some have concern about how his changeup-only repertoire will play against upper-level competition. Shore’s excellent career at Florida offers some hope in that regard, and he could move quickly as a back-end starter candidate. Has produced 1.43 career WHIP. 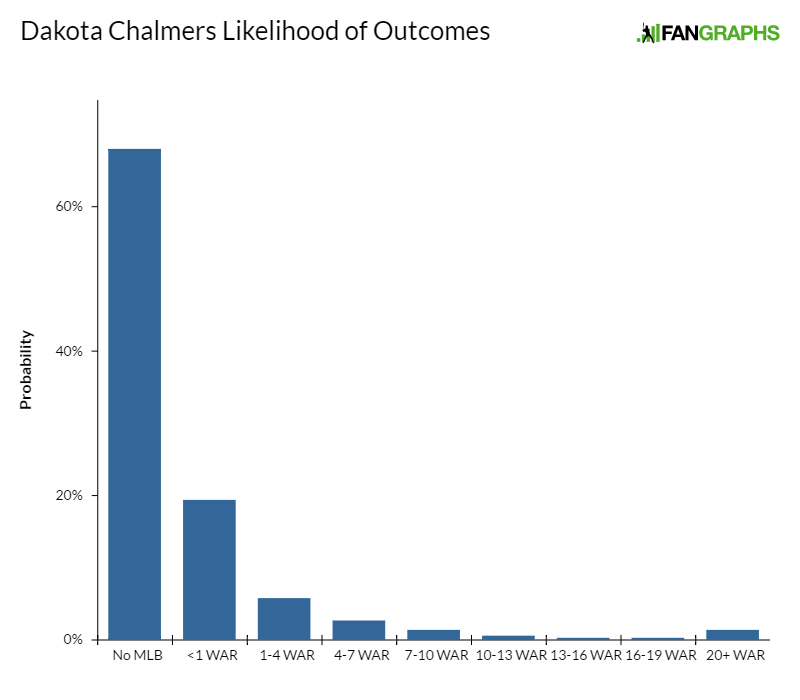 Chalmers got an overslot $1.2 million as a third rounder in 2015 and brought bat-missing stuff to pro ball. He sits 91-94, touching 96 with the fastball, and breaks off an impressive low-80s curveball, which flashes 55 on the scouting scale. He also has an underrated, potentially plus, mid-80s changeup that’s effective largely because of Chalmers’ electric arm speed. But Chalmers has 30 control right now. His delivery is excessively violent and walks have been a pervasive issue throughout his pro career. He has mid-rotation stuff but needs to polish up his strike throwing just to pitch in the big leagues at all, let alone as a starter. He doesn’t turn 21 until October, so there’s still time for development in that regard. Some scouts are discouraged by the lack of progress Chalmers has made; others remain very intrigued by his electric stuff. Among the several interesting prospects Oakland has signed out of Cuba during the current July 2 period, Ruiz is the closest to impacting the major-league club. He signed for $2 million around New Year’s. The undersized righty has two useful secondary pitches, the best of which is an upper-70s split/change with late fade. Ruiz is undersized and is a short strider with a low-three-quarters delivery. Some scouts are concerned lefties will feast on his 89-92 mph fastball, but the changeup could mitigate those issues. Ruiz also has a fringe to average slurvy breaking ball that plays up against righties because of his arm slot. Ruiz hasn’t arrived in the states yet as he deals with visa issues, but he’s throwing at the club’s complex in the Dominican Republic and should be up to speed fairly quickly when he arrives. There’s some reliever risk here due to the delivery and strike-throwing ability, which was inconsistent during Ruiz’s tenure in Cuba, but No. 4-starter upside if the command develops. Among a bevy of interesting teenage Latin American prospects making their A’s stateside debut last fall during instructional league, Vargas asserted himself as the best of the group by showing promise on both sides of the ball. Scouts came away impressed by his defensive actions and footwork; they feel comfortable projecting him at shortstop. And while Vargas has some mechanical maintenance to perform, he has a chance to hit. His bat speed is solid, his swing has a little bit of natural loft, and he’s going to get bigger and stronger — but perhaps not so big that he has to move off of short. He is still eons from the majors, but early returns are very promising. He got $1.5 million in July. Slashed .295/.352/.438 at Triple-A in 2016. 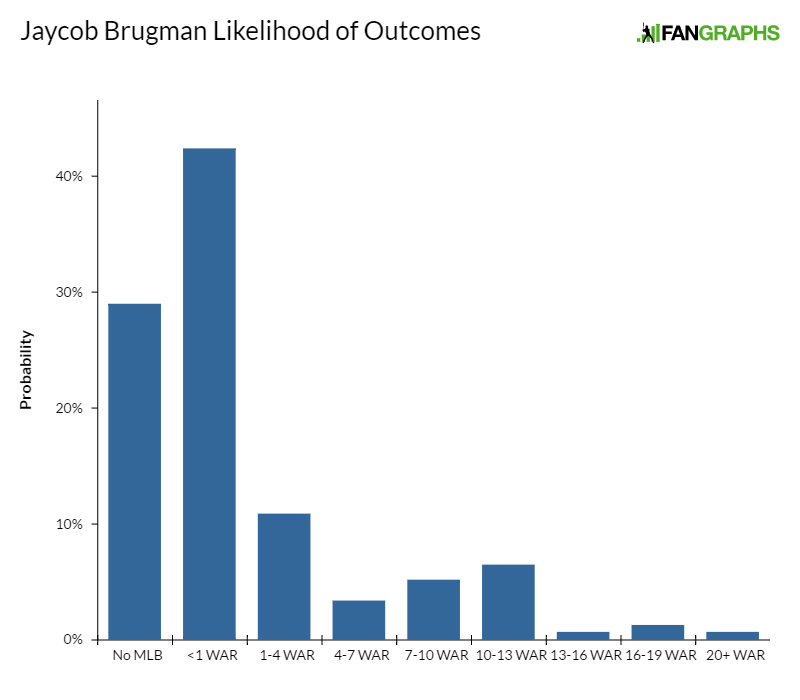 A quintessential tweener, Brugman is a high-character prospect with fringe to average tools across the board. He has a solid approach and bat-to-ball skills but lacks the power to profile in the corners and doesn’t run well enough to play center field full time. He should be an excellent bench outfielder for a long time. As with most prospects from BYU, he’s a bit old for the level (already 25). Once he’s off the DL, though, he should debut this year. Slashed .240/.286/.367 at Double-A in 2016. 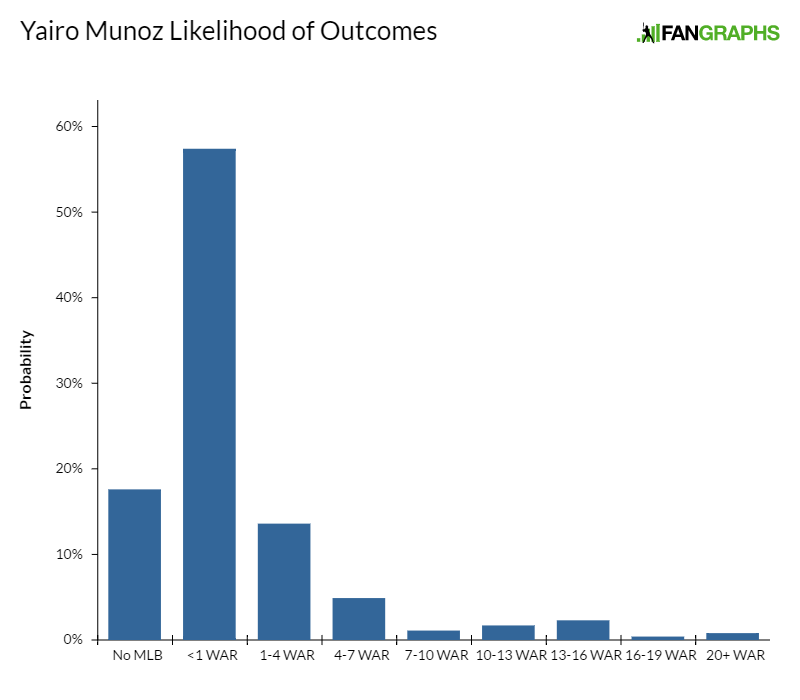 Munoz has outgrown shortstop and moved full time over to third base, where his plus-plus arm is frequently on display. He is notoriously difficult to strike out because his swing is almost comically simple. He uses no stride at all and simply shifts his weight from back to front, throws his hands at the ball, and let’s his whippy wrists create the strength of his contact. While Munoz does have above-average bat speed and good raw power, his in-game swing is geared for ground balls, nor does he project to have the kind of game power that profiles at the corners. He’s also an aggressive hitter with limited on-base ability. At just 22 years old, Munoz is already in the upper minors. (He’s dealing with a hamstring issue in Extended, and I haven’t seen him playing down here yet. This is the second consecutive year his season is getting off to a late start due to injury). He either needs to make an adjustment to start hitting for more power or expand his defensive horizons before he becomes a big leaguer. He projects as a second base/third base/outfield bench option. Recorded .082 ISO in Cal League last year. More twitchy and explosive than he is smooth and elegant, Martin projects to play an above-average defensive shortstop largely due to his exceptional quickness and foot speed. He also has a plus arm, terrific field awareness, and scouts are comfortable projecting him at short. Offensively, Martin’s production is grounded in his patience at the plate. He has great ball/strike recognition and is adept at avoiding breaking balls. His physical tools at the plate are limited. His bat speed is average at best and the length in Martin’s swing causes him to pound balls into the ground. He could be a 40 hitter with 30 game power; even at shortstop, that might not play every day. 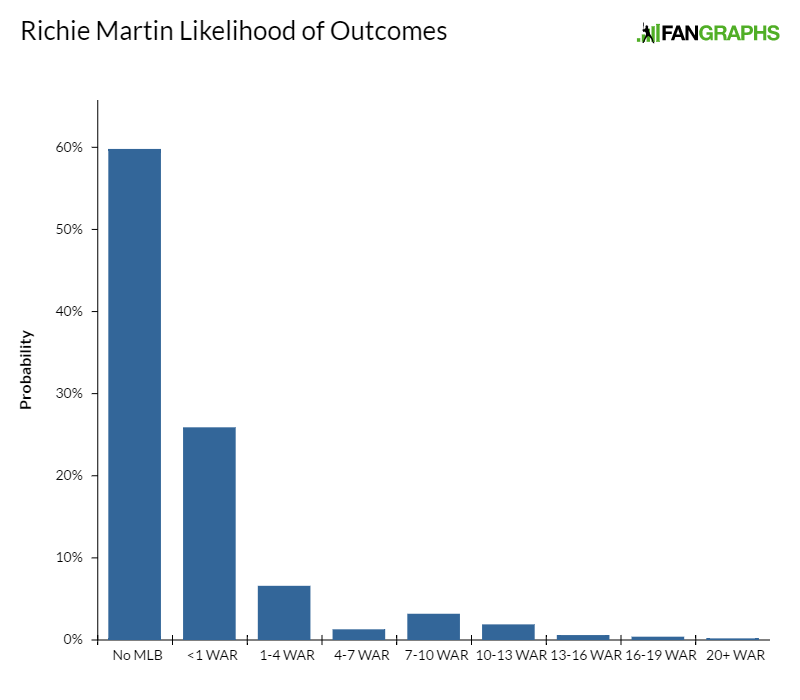 If the on-base skills max out, Martin has a chance to be a regular. If not he looks more like a glove-first utility man. Steamer projecting an 87 wRC+ for 2017. 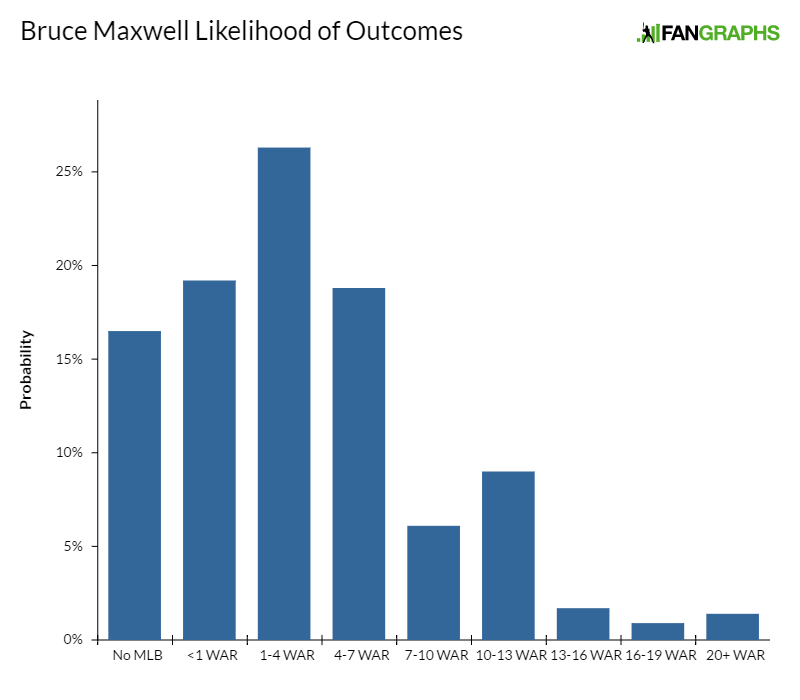 Maxwell spent time behind the plate and at first base at Division III Birmingham-Southern but has caught full time in pro ball and turned himself into a terrific receiver with a solid-average arm. He used to have issues with passed balls but seems to have remedied that, and his makeup is purportedly excellent. Maxwell has fringey bat speed but can move the barrel around the zone, and he tracks pitches well, projecting as an average hitter. He lacks power but should have a long big-league career as a backup, though some scouts are skeptical about him hitting enough to be more than an up-and-down catcher. Hit .235 at Triple-A in 2016. After tantalizing stat-line scouts with his 2014 Cal League performance, Olson has struggled to produce the output commensurate with first-base and corner-outfield prospects. His swing’s length and his passive approach have resulted in high strikeout totals and his power production has dipped. His career-long struggles against lefties reached a peak last year, as he hit just .167 off southpaws. 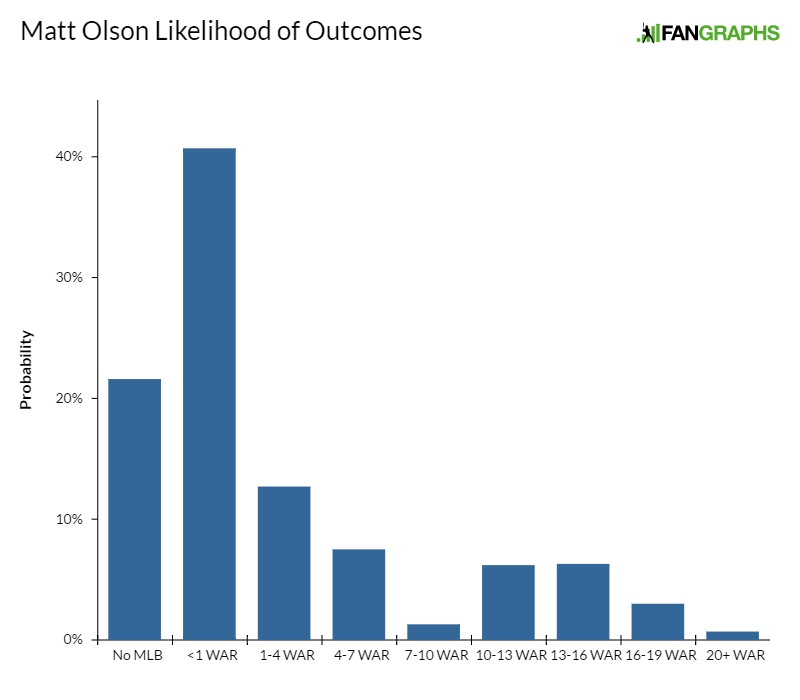 But Olson’s plus power and patience are likely to yield big-league production off the bench or in a platoon role. He’s limited to the corners on defense but has the arm for right field and has, interestingly, played a game at third (and looked alright) already this spring. None. Dealt with hand injury in 2016. Murphy’s above-average raw power (which he developed as he gained 50-plus pounds and grew nearly six inches in college) was masked by a hamate injury during his junior year. He’s a bit stiff and slow twitch in the batter’s box but has power and a mature idea of the strike zone. He also has terrific catch-and-throw skills. I timed him at 1.83 on a pitch out last fall and 1.94-1.97 on other throws. His throws are consistently on the bag. There’s some concern about how Murphy’s size will impact his mobility as he ages, but he’s a passable blocker and solid receiver with high-end makeup and should be fine defensively. Scouts aren’t sure if Murphy’s going to make enough contact to play every day but at least have him projected as a power-before-hit backup who makes opposing runners obsolete with his arm. The body-beautiful Lazarito was hyped in a way few international prospects ever have been, largely because his name was catchy and because his physique was so incredibly photogenic. Armenteros does have big tools, including plus bat speed and raw power. And while he’s above-average runner (I watched him triple yesterday), he’s extremely raw overall and likely ticketed for left field because of his arm. That’s going to put pressure on the bat and, while he has the power to clear that bar, his bat isn’t in the hitting zone very long, and he’s often lost out on his front foot against breaking balls. Adjustments are going to be necessary and those will require athleticism. Armenteros is explosive, but I’m not sure he’s athletic. He has an odd gait and is a bit of a waddler. If he starts hitting, he has big upside, but there’s significant developmental distance to travel in that regard. He signed for $3 million and, even with the high risk here, it was probably worth it for Oakland to take a shot on him panning out because they really don’t have many other ways to acquire potential stars. While I’m currently apprehensive about projecting him as one, Lazarito has a puncher’s chance to get there. Pretty sure Cistulli is going to bombard you with these below. Drafted at the behest of Washington’s analytics department, Schrock’s extreme ability to avoid strikeouts has endeared himself to the analytically minded prospect hound, most notably FanGraphs editor and resident kook, Carson Cistulli. Scouts like Schrock’s bat-to-ball skills (he has great pitch recognition, tracks pitches well, and is very short to the ball) and think there’s a chance he hits enough to carve out a low-end everyday role. But they consider it more likely that he plays some sort of utility role that would require him to start working at new defensive positions, something Schrock hasn’t done much of in pro ball just yet. An overslot fourth rounder, Szynski has a great pitcher’s build and sits in the low-90s, will touch 94 with downhill plane, and has some breaking-ball feel. His mid-80s changeup has some tumble. Pro hitters squared up his heater last year and Szynski is starting 2017 on the rehab list in Arizona, but he has back-end starter potential if he can get healthy and find a way to keep hitters off of his fastball. Struck out 10 over 5.1 innings in spring training. Wahl’s stuff came back after elbow surgery in 2015 and was sitting in the mid- to upper 90s last year. He has a power breaking ball that misses bats when he breaks it off well, but he doesn’t do that consistently. He’s an arm-strength relief prospect who could debut this year, but a lack of command and a consistent, bat-missing secondary likely limits his ceiling to middle relief despite the 70 heater. Oscar Tovar, RHP – Tovar was 92-94 last summer but sat at 90 with his fastball last week in extended spring training. He has advanced pitchability, using his breaking ball and changeup heavily. His slider breaks late and is a potential above-average offering, while Tovar’s changeup has some fade to it but is easy to identify out of his hand right now. Some scouts think Tovar has a chance to develop into a back-end starter; others (and I fall into this camp) are interested in how the fastball/slider combination plays out of the bullpen. It’s too early for a conversion, though. He missed time due to a PED suspension last year. Joe Wendle, 2B, 1.2 KATOH+ WAR – The first player drafted out of West Chester to reach the majors since John Mabry, Wendle reached the bigs last year as a hit-only second baseman. He lacks the power to profile at the position every day, his strikeout rate ticked up as he reached the upper levels, and his walk rate has sunk. He played shortstop in Mexico last year and if improved defensive versatility can be attained, Wendle would make for a nice bench bat. For now, though, he looks like an up-and-down second baseman and unlikely to usurp Pat Kelly for the mantle of Best Big Leaguer to ever come out of his college. Marcos Brito, 2B – Brito has great feel to hit from both sides of the plate. He’s undersized and likely a second-base-only prospect, but if he can add strength to his diminutive frame as he ages (the way Phillies 2B Cesar Hernandez, who has similar measureables and build, did) and make louder contact, he’s going to be a dude. Of all the teenage July 2 signings from the last year, Brito could move quickest because of his bat, but he lacks Vargas’s or Lazarito’s upside. Luis Romero, RHP – A great-bodied 23-year old righty with a beautiful arm action, Romero was up to 96 the day before this list was published, sitting 91-94 with a 40 slider in the 82-87 mph range. He also throws a critter with screwball movement in the upper 70s which I think has a chance to miss bats. He’s about 6-foot-2, 190, very athletic. Renato Nunez, 4C, 2.1 KATOH+ – While Nunez has been bumped down the defensive spectrum by superior prospects like Chapman and Ryon Healy (inadvertently improving his versatility) his swing-and-miss issues have been exposed at upper levels. He has big raw power and could profile as a four-corners bench bat, but there’s a chance he never hits enough for that. Kevin Richards, CF – A 70 runner who is raw in all facets of the game, Richards has a projectable build. He’s likely going to be a multi-year complex-level project but merits attention because of his body and speed. Raul Alcantara, RHP, 1.8 KATOH+ – A relief-only prospect with a low-90s fastball that was tagged in the big leagues last year, Alcantara has been working more with a two-seamer to try to add movement to his fastball. He has a diving changeup and hard cutter/slider but hitters pick up the ball early out of his hand due to a long arm action. He projects as an up-and-down relief option. Casey Meisner, RHP, 0.2 KATOH+ – Yet to recover from an ill-fated mechanical change, Meissner’s once promising three-pitch mix is down across the board. If it returns he could be a rotation piece. Paul Blackburn, RHP, 0.8 KATOH+ – A pitchability righty with a good curveball, Blackburn was acquired from Seattle in the Danny Valencia deal last fall. He projects as a sixth starter or swingman. James Naile, RHP – A strike-throwing sinker/slider righty, Naile was drafted in the 20th round in 2015 but has already reached Double-A and could provide rotation depth at peak. George Bell, Jr., ? – A physical-projection lottery ticket, Bell has good bat speed and might grow into considerable raw power, but he’s at least moving off of shortstop and to third base and potentially off the dirt entirely. Enry Pantoja, OF – Signed along with Romero, Pantoja is a strong bodied outfielder with good bat speed but has swung at non-competitive pitches this spring and needs to improve his selectivity. Abdiel Mendoza, RHP – A short, 135-pound Panamanian righty with good curveball feel, Mendoza will carve up the lower levels with the breaking ball and hopefully add strength as he matures. In each of the first 29 installments of these organizational lists by Eric Longenhagen, this section has been reserved for a compelling player who (as noted by the italicized text just above) “received less than a 40 FV” from the lead prospect analyst. In the case of this Oakland list, however, I’ve designated Schrock as Cistulli’s Guy not because he received a 40 FV or lower from Longenhagen, but because my estimation of Schrock’s talents so considerably exceeds Eric’s that it would be absurd to dedicate these paragraphs to anyone else. Previously in these electronic pages, I’ve presented an unassailable case for Schrock’s future as an MVP. Much of what I would say here is included in that post. Briefly stated, though, Schrock’s carrying skill is his elite contact ability. Paired with what appears to be average power and adequate second-base defense, the result is a promising future major leaguer — promising, in particular, relative to the modest pedigree. Schrock’s 6.7% strikeout rate last year at Low-A would have been the lowest such figure at that level had he qualified. His 9.0% strikeout rate at High-A would have been second lowest at that level were he to have qualified there. Following a late-season promotion to Double-A, Schrock struck out zero times in 24 plate appearances. That’s the lowest amount possible. 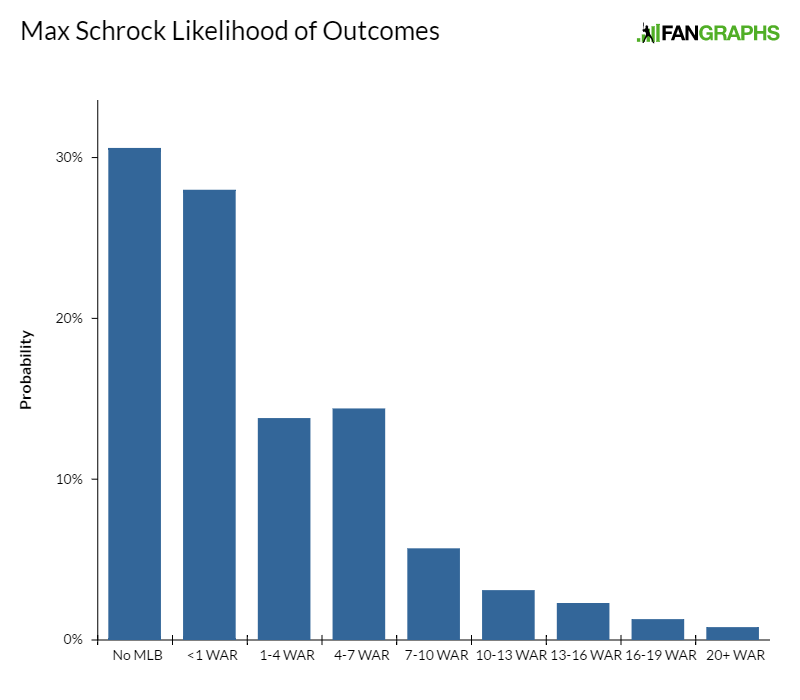 There’s little from his 2017 sample at Double-A, as a 22-year-old, to suggest that Schrock is any less worthy of the optimism exhibited by the author. He remains a promising candidate for major-league success. This system has good depth and a few potential stars littered throughout the minors, all with varying degrees of risk. The club seems less concerned with pitcher size than most other teams. (Jesse Chavez, Sonny Gray, Scott Kazmir, Cotton, and Jefferies are all examples. The list is really long.) I think that makes them more likely to consider 6-foot arms like UNC’s J.B. Bukauskas or Georgia high-school lefty D.L. Hall in the upcoming draft. As noted in the Barreto and Pinder paragraphs, I think the club is also more loose with what they consider a viable defensive shortstop, possibly due to the way batted-ball data allows players with lesser natural range to mask that particular inefficiency. We hoped you liked reading Top 24 Prospects: Oakland Athletics by Eric Longenhagen! Staying elite is only for a limited time, and wealth can get eaten away real quick. Being body-beautiful, on the other hand, is a lifetime gift.